This biography is dedicated to the memory of Sherwin Amimoto, colleague and friend, who for many years was my guide to Buddhism and Japan. 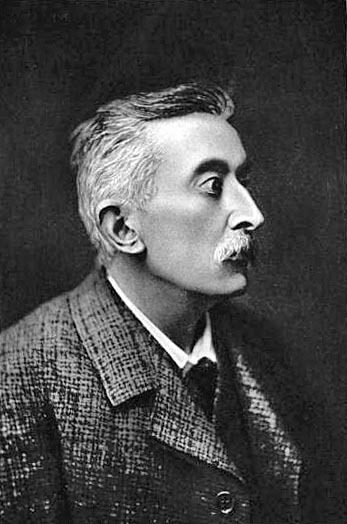 It was he who introduced me to Lafcadio Hearn. Once upon a time, in the early years of the 20th century Lafcadio Hearn's romantic articles in Harpers Magazine and in the Atlantic Monthly were avidly read in the West. No longer. This is a shame: He may only have been a second rate novelist, and he knew that, but his journalistic oevre contains a number of very lively, sometimes wildly poetic descriptions of natural phenomena, landscapes, events, and people which are still highly readable and enjoyable. Hearn was born of a love relationship bewteen an Irish military surgeon, Charles Bush Hearn and Rosa Antonia Tessima Kassimati, a Greek woman in Lefkas, Greece, where his father was stationed with the British army in 1850. They baptized the child Patricio Lafcadio Tessima Carlos Hearn in the local Greek-Orthodox church. He died in Tokyo in 1904 as Koizumi Yakumo, a Japanese citizen with a Japanese name, a Japanese wife and 3 children; as lecturer of English literature at Tokyo Imperial and Waseda Universities, a member of two academies. In fact, to this very day he is remembered and revered as a national hero, almost a saint in Japan in honor of his having saved Japanese folklore and culture from destruction during the critical end of the 19th century. In between those years he lived a most erratic, unsteady life. Haunted by restlessness and a fickle fate from Greece to Ireland and England to Cincinnati and New Orleans in America, the West Indies and finally as a reporter for Harpers Magazine to Japan - from where he never returned to the West. Yet on all these places he put a lasting mark.